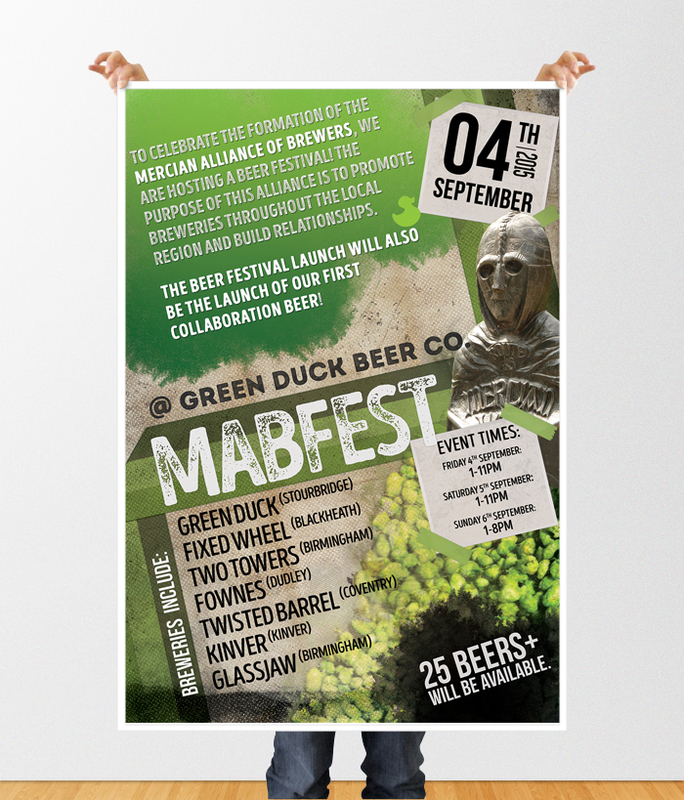 I was privileged to be invited to do the design and artwork for the first Mercian Alliance of Brewers (MAB) festival held at Green duck in September. Over a series of months I got to know a more extended network of brewers, some which composed the core of the MAB. The theme for this event and future festivals would revolve around Mercian Kings. The the story behind MAB is about of six local breweries, located from Dudley to Coventry which unveiled the union at a launch event held at the Green Duck Brewery at the beginning of September 2015. The alliance includes; Fixed Wheel Brewery (Blackheath), Fownes Brewing Co. (Dudley), GlassJaw Brewing Co (Birmingham), Green Duck Brewery (Stourbridge), Twisted Barrel Ale (Coventry) and Two Towers Brewery (Birmingham). Future events will involve other breweries who wish to collaborate. 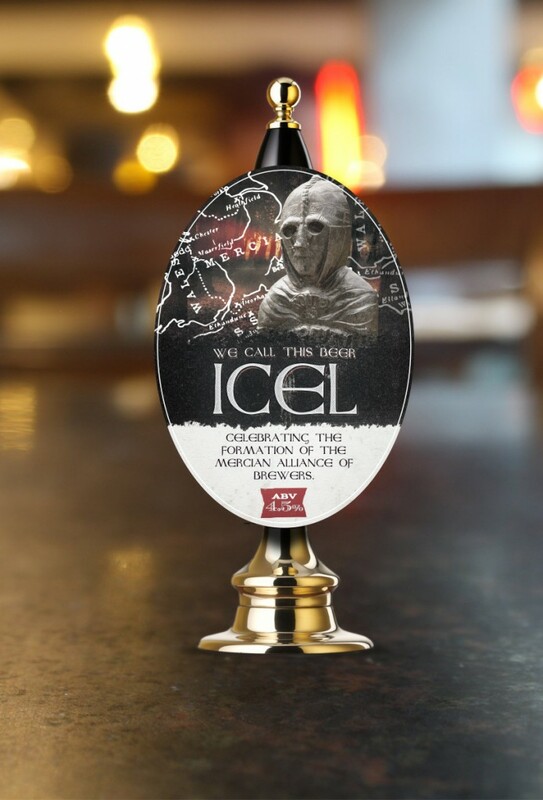 Icel was made as a combined effort from all breweries at Twisted Barrel Brewery and Tap House in Coventry on 29th July 2015 and used the best of British ingredients as its inspiration; Maris Otter forming the malt base and Bramling Cross the hops. The Mercian Alliance exists to promote the wealth of new and exciting handcrafted beers produced by micro breweries across the region, with more festivals curated by and showcasing beer from the breweries involved being planned for 2016. There is no depiction of Icel, so I went about using a photo of the cast-iron Anglo Saxon warriors that stand guard as way-markers along the Mercian Way.An old Kingdom map, with the Kingdom of Mercia lined to the eye line squares of the theme. The eerie forest in the background with the red, diffused light gives the composition the air of mystery we were after. The design was adapted from the cask version to the much smaller keg lens. Typefaces dominated by the Anglo Saxon Caps project by Peter S. Baker. Further material included a promotional poster as well as a beer list, double sided A5 flyer. 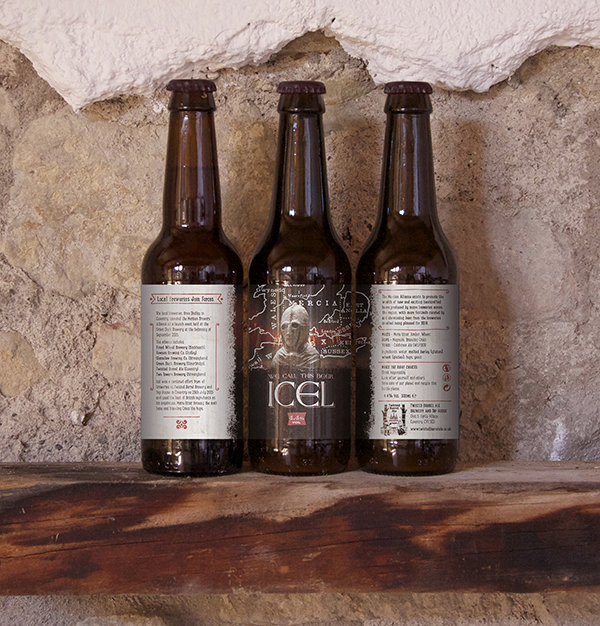 Icel was bottled at the tail end of 2015.